Feel that chill in the air? 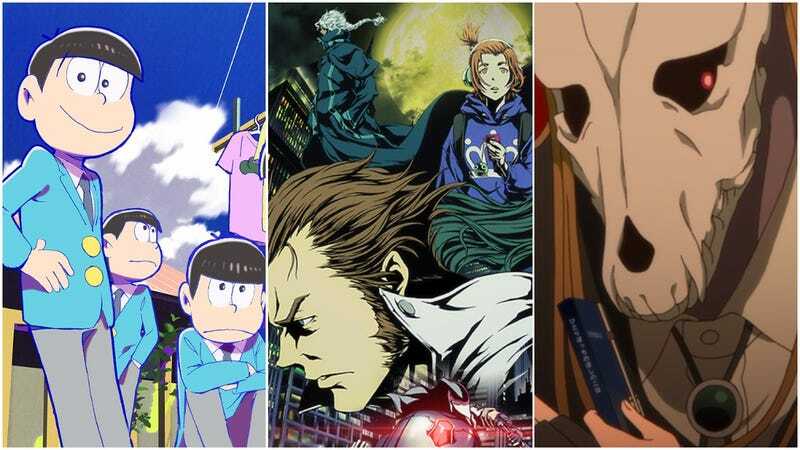 It’s no longer summer, so let’s welcome autumn the best way possible: by watching new anime. Below are the fall 2017 anime shows and where to watch them. Have a look and hit us up in the comments, telling us which ones you plan to watch and which ones you plan to skip. Update October 9 - 7:00am: More simulcasts added. What It’s About in One Sentence: A mysterious warlock is engaged to a young slave girl with life-draining magical abilities. What It’s About in One Sentence: A schoolgirl who falls in love after joining her school’s anime club tries to keep the school from disbanding it. What It’s About in One Sentence: Two boys—one with uncontrollable magic and the other with anti-magic—try to become the king of wizards. What It’s About in One Sentence: This anime follows the crazy antics of a cafe staffed with anime archetypes like tsundere, imouto, oneesan, idol, and sadist. What It’s About in One Sentence: What was once New York is now a haven for monsters and the crime fighters who battle them. What It’s About in One Sentence: This anime follows the continuing adventures of high school students who battle with cards. What It’s About in One Sentence: A boy from an island that floats on sand meets a mysterious girl who changes his life forever. What It’s About in One Sentence: The second season of an anime about classical composers with names like “Beethoven” and “Mozart” who show up in modern Japan, wielding special powers and wearing funny clothes. What It’s About in One Sentence: A girl who burns anything she touches escapes capture thanks to a master thief and goes on adventures. What It’s About in One Sentence: A school boy’s horrible nightmares are nothing compared to when he crosses paths with a group of sorcerers resurrected by Nazis. What It’s About in One Sentence: The latest season of Dream Festival brings more dreamy boy bands for your viewing pleasure. What It’s About in One Sentence: A “real” look at the lives of young rocker studs. What It’s About in One Sentence: The continuation of an anime about a student who moves into an apartment that’s filled with all sorts of monsters and spirits. What It’s About in One Sentence: A young man is sent to an internet-addiction rehab center that’s more like a sadistic prison. What It’s About in One Sentence: The students at an elite cooking school are back for another helping. What It’s About in One Sentence: The latest Gintama scenes brings gags from the manga to life. What It’s About in One Sentence: After the apocalypse, two girls look for food as they try to survive. What It’s About in One Sentence: At school, Umaru is a beautiful ace student, but at home, she’s a junk-food-eating loafer. What It’s About in One Sentence: Hozuki has a tough job: He works for the King Enma, the ruler of Buddhist hell. What It’s About in One Sentence: The daily life of idols continues in the second season of The Idolmaster Cinderella Girls Gekijou. What It’s About in One Sentence: These idols come from all walks of life, whether they are a former lawyer, a former pilot, or even a former surgeon! What It’s About in One Sentence: Some of Japan’s most famous superheroes answer a young woman’s call to save others. What It’s About in One Sentence: A mysterious explosion turns an old man into a powerful machine and a young man into a murderer. What It’s About in One Sentence: Twelve combatants representing the Chinese zodiac calendar duke it out in a tournament held every twelve years. What It’s About in One Sentence: The lives of high school students get somewhat complicated with the arrival of a transfer student. What It’s About in One Sentence: High schoolers get mysterious text messages that they must follow or risk death. What It’s About in One Sentence: Kino and her talking motorcycle travel across the beautiful yet potentially dangerous countryside. What It’s About in One Sentence: Fox-girl Yuzu gets a new job at a local hot springs, and as she learns the ropes, she befriends the other fox-girls who work there. What It’s About in One Sentence: Anthropomorphized jewel people live in a jewel country that must defend itself from the moon people. What It’s About in One Sentence: A married couple gets closer thanks to the effects of alcohol. What It’s About in One Sentence: The second season of an anime about different rice varieties reborn as school boys who try to become the most popular grain at their school, overtaking their rival, bread. What It’s About in One Sentence: The second season of an anime about schoolgirls trying to make their idol group dreams real. What It’s About in One Sentence: The continuations of the story about a friendship between a depressed 17-year-old pro Japanese chess prodigy and a neighborhood family. What It’s About in One Sentence: A schoolboy confesses his feelings to a schoolgirl who, he learns, is a perv. What It’s About in One Sentence: While looking for a marriage partner, a teacher meets someone who looks familiar—one of her students in disguise! What It’s About in One Sentence: Onyankopon helps schoolgirls with their problems by using the power of song and dance. What It’s About in One Sentence: A short anime that follows the saucy nightlife adventures of youkai. What It’s About in One Sentence: The sextuplet Matsuno brothers are back for more zany antics. What It’s About in One Sentence: Rainy Color café is struggling, but maybe a shiba inu with a nose for good coffee can turn things around. What It’s About in One Sentence: The virtual life of an online role-play game playing 30-year-old collides with her real world one. What It’s About in One Sentence: Handsome werewolves and vampires duke it out for supremacy in this fantasy anime. What It’s About in One Sentence: A brilliant novelist is obsessed with the idea of having a sister. What It’s About in One Sentence: A college student realizes he’s turned into a tiny version of himself after arriving in Tokyo. What It’s About in One Sentence: The second season of the classic anime series Time Bokan update, in which adventurers time travel in bug-shaped vehicles. What It’s About in One Sentence: A production company turns handsome boys into superstars. What It’s About in One Sentence: Schoolgirls race to win in an anime centered around the world of sidecar racing. What It’s About in One Sentence: After being saved by a vampire and turned into one, a young boy joins a secret society of immortals and learns more about his own supernatural heritage. What It’s About in One Sentence: Schoolgirls defend Harajuku from aliens out to steal their subculture. What It’s About in One Sentence: Another idol group from Sendai gives it their all in their quest for superstardom. What It’s About in One Sentence: High school students fall in love in this six episode-long anime.